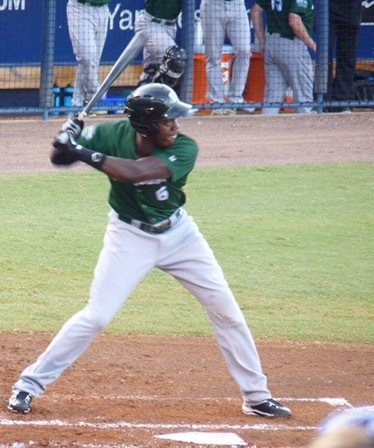 Today’s prospect watch is on Aristides Aquino, who is currently at high Single-A in the Cincinnati Reds farm system. Aquino has had a great season and could arguably be considered the Daytona Tortugas MVP this year. In addition, he could be their MVP, as he has 16 home runs and 60 RBIs on the season, which both are the most on the team. In 100 games and 390 at-bats, he has batted .282 and slugged .515 at the plate. Out of those 390 at-bats, he has totaled up 110 hits and 21 of those hits are doubles and 11 of those have been triples. The right fielder has speed to his game that allows him to get to any base he wants. He stole 10 bases this year. Furthermore, the 22-year-old prospect has a rocket of an arm in right field, which is the position he will continue to play at in each level of the game of baseball. His speed also allows him to run down uncatchable baseballs and to hold a runner to a single instead of a double. Finally, if he continues to progress this way, he will be in Cincinnati in the year 2018. Note: he is the Reds 21st overall ranked prospect.